I have reached the last leg of this journey, and will be wrapping up Lydgate’s “A Complaynt of a Loveres Lyfe,” starting from where I left off last time. At youre shame gan laughe and smyle. In the first stanza the narrator plays a common role as can be found in the Canterbury Tales, Troilus, Temple of Glas, and Confessio, among others, in which a speech to Venus is in order. However, unlike other instances, especially in cases that retell the discovery of Venus and Mars, here is one of the few instances that incorporates the public disquiet associated with the affair, along with the punishment Venus and Mars incurred. For those of you unfamiliar with the story, Venus and Mars were having an affair, of which Venus’s husband, Vulcan, was suspicious. In an attempt to catch them he forges an invisible net that traps them while conducting their affair. While they remain ensnared, he gathers the other gods to come witness their shame. Generally this part is either left untold, or as within the Confessio, the lovers are seen in a more positive light. Lydgate quite brusquely makes mention of it, but without commentary, leaving the reader to draw their own conclusion. This second stanza is a parallel to Troilus’s assessment of Venus in Book III, where he refers to “Venus mene I, the wel-willy planete” (line 1257). Er fals Daunger sle hem and confounde. The trew man that in the erber lay. The narrator begs Venus to descend upon the saddened knight before “fals Daunger” gets a hold of him, in a reference to both Danger as personified in the garden, constantly attempting to thwart the lover, but also danger in the literal sense, alluding to what occurred to Venus’s other previous love interest, Adonis. Recured be er May come eft agen. This is the traditional ending of the topos, in which the narrator must depart to return to his own home/dwelling/reality. Here it appears he is leaving because night has fallen, he is tired, and wishes to go to sleep. Thus his narrative was spent across the larger part of a day. His oune lady in armes to embrace. Werred Trouthe with his tiranye. He follows one convention with another, and bids farewell to lovers and ladies everywhere. While he was unable to console the knight, he will offer some kind words to others, namely his audience. Let him agein be provoked to grace. Fals Daunger to occupie his place. Recure to fynde of myn adversité. Lydgate closes in an envoy de quare addressed to princes everywhere. Note, that princes is used as a generic term to indicate an elevated status and is not restricted to men, especially considering the large number of women who were active participants in literary culture. The conceit was borne from the Latin Classics poets, namely Horace and then Ovid. The form changed over time, and was again taken up by Dante and Boccaccio. 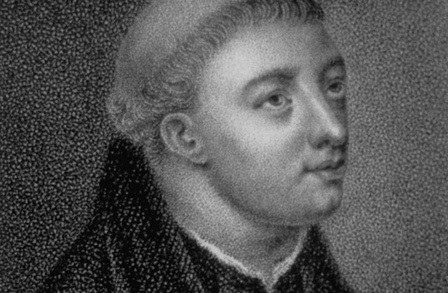 Lydgate may or may not have read any of these previous non-English uses of the envoy, especially since his use of the envoy de quare has his unique flare, and one of the facets of his writing for which he is well known. With this, the poem ends, and we are left with a knight in the same state of sadness and woe as he was found at the beginning of the poem. His lady does not grant him her grace. Even as he laments his disappointment at having had his true and noble endeavors spurned, the reader cannot help but notice his words that juxtapose his stated intentions as he ends by blaming all others for his pain, as opposed to perhaps reconsidering his own actions at wooing his lady, and the reasons for why she may have been hesitant to acquiesce to his requests. We are left with an image of the knight as barely being able to adequately express his conundrum, at best launching off into a tirade of rhetorical lists that span through the stanzas with dizzying effects. As an early work, this serves well as an exercise for Lydgate’s ability to make references, while inadvertently later serving medievalists everywhere an opportunity at identifying and understanding them. It has been enjoyable. I am admittedly running behind on Lydgate’s “A Complaynt of a Loveres Lyfe,” but I am still hopeful that I will have it done by the end of summer. With that said, here is the newest installment following where I last left off. Or that I ever saugh the bright sonne! Oonly for trouthe I may hit not astert. So helpeth to this werk that is bygonne” (Book III, lines 733-735). Similar conceits can be found in the Knight’s Tale (line 1566) and Good Women (lines 2629-2630). To mordre Trouthe hath taken Daunger to guyde. Thro hasty beleve of tales that men feyn. Natur,e acting with godlike capacity, is also not a new concept, and had been seen in other works, notably Parliament in which Nature becomes the arbiter for the birds’ conundrum. The concept is also present in the Physician’s Tale, and the Roman. And, saue his lady, euery creature (line 207-209). For the lover, reaching his lady becomes an insurmountable task. The parade of characters who work against him continues to grow, and he is left relying on Pity to counter the rest, and make his way into the lady’s heart on his behalf. For further comparisons of these key figures, look at the Roman (lines 2800-3300) and Romaunt (lines 3000-3500). And lye and blede upon this colde grene. Now mercie, suete, mercye my lyves quene! In your servise that your man may dey. The lover’s death brought about by lovesickness is just as common as the other tropes Lydgate employees in these stanzas. For instance, Troilus on several occasions bemoans his fate, believing himself to be on his deathbed, with no other cure than love from Criseyde. Or, in Belle Dame, the lover actually dies from lack of love (even if the lack of love is a result of his lady’s death). Lovesickness in the Middle Ages was no trifling matter. Also, there is a quick reference to Chaucer’s Complaint in “Myn hertes lady and hool my lyves quene” (line 54), referring to the lady as the queen of the lover’s life since she has the power to end it by withholding her love. That by youre wille I was broght to my grave. Of mercie charme, and also of womanhede. Redy to dye yf that ye assent. Sufficeth me to dye in your servise. The plea for love continues, and the knight refers to the lady’s love as a “charme,” a thing, that will further harm the lover if his affection remains unrequited, in the same way as Troilus used the word (Book II, line 1314). The knight appears content in abandoning everything to love’s guidance, even if it leads to his death. Er then I die, may know my trouthe. When all else fails, the lover turns his complaint towards God, to be heard by Him before what he believes will be his death. If I for-go that I so deere haue boughte? Was fals ne neuere shal til that I dye” (line 1654-1657). Ironically, even as the lover speaks to God, he acknowledges God’s omnipotence in knowing all men’s thoughts. Basically, even without voicing his lament, God would have been privy to the knight’s trials. Thus the lament is more of an aside, less destined for God as the audience, but nevertheless serving as a means of confession along with the release that that entails. The knight laments away, and when I return to this piece we will see how the godlike figure in his life morphs throughout the narrative.